D&D Pharma is pioneering the development and successful application of phage-based therapeutic solutions. It is our vision to offer effective patients therapy options in indications with acute and growing medical need. Much like with the first antibiotics, the answer to the growing problem of infection control lies in understanding efficient natural anti-pathogenic mechanisms, borrowing their efficiency and transposing this efficiency into clinical practice. Help us help you and other patients by sharing your story with us. The absurdity of the superbug crisis consists of the fact that it can be demonstrated that we had technology, namely bacteriophage therapy, long before we created the antibiotic-resistance superbug crisis through massive abuse of antibiotics. Additionally many politicians, bureaucrats, scientists and members of the public health community are or should be well informed about a phage therapy which can cure many superbug infections. 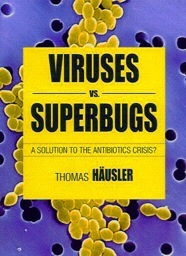 In spite of a voluminous literature attesting to the scientific validity and medical effectiveness of phage therapy (see http://www.phage.org and find phage therapy references), there are still phage therapy deniers who would resist the careful deployment of these weapons of mass-destruction for specific pathogens in the war with superbugs. Bacteria resistant to most or all available antibiotics are causing increasingly serious problems, raising widespread fears of returning to a pre-antibiotic era of untreatable infections and epidemics. Despite intensive work by drug companies, no new classes of antibiotics have been found in the last 30 years. There are hopes that the newfound ability to sequence entire microbial genomes and to determine the molecular bases of pathogenicity will open new avenues for treating infectious disease, but other approaches are also being sought with increasing fervor. One result is a renewed interest in the possibilities of bacteriophage therapy — the harnessing of a specific kind of viruses that attack only bacteria to kill pathogenic microorganisms (cf. Levin and Bull, 1996; Lederberg, 1996; Radetsky, 1996; Barrow and Soothill, 1997). French native Henri Lemaitre is hoping for a cure. A fall from a ladder had tragic consequences for him. He underwent surgery several times and was infected with a life-threatening resistant bacteria in the hospital. No antibiotics were helping. It looks like only an amputation can save Henri Lemaitre. Doctor Alain Dublanchet from Paris is now trying to use Bacteriophages to remove the infection and save Henri Lemaitre. More people in hospitals become infected with resistant bacteria that doctors cannot treat with antibiotics. In Europe it is estimated that 25,000 people die because of this. Some of the bacteria also occur in the livestock industry, such as MRSA and ESBL. Because of a long and intensive use of antibiotics in animal husbandry these bacteria have become resistant to most antibiotics used in hospitals. Healthy people won’t die of these killer bugs, but to people with a strongly reduced general resistance, such as cancer patients, they can be lethal. More people than ever picked up life-threatening infections while spending time in hospitals last year. The number of hospital-acquired infections has doubled from 22,488 to 42,712 in just two years, the Daily Mail reported. The figures, from the NHS Information Centre, refer to all infections including superbugs MRSA and Clostridium difficile, plus others such as norovirus and E.coli. Most of those who are affected by them are elderly, which means that their chances of recovery are very limited. It wasn’t understood exactly why healthy children who fell ill with the H1N1 flu, during the 2009 epidemic, became critically ill. The Children’s Hospital in Boston has found one key risk factor is MRSA (methicillin-resistant Staphylococcus aureus). Those carrying the bacteria had eight times the risk of mortality amongst previously healthy children. Copyright © 2012 D&D Pharma. All rights reserved.